In August I was browsing through the Kirpalu catalog and was seized by a heretofore unknown urge to sign up for “Holotropic Breathwork” with the venerable Prague psychiatrist Dr. Stanislav Grof and his assistant Tav Sparks. I’m not certain what made me so sure I wanted to do it, but I had absolutely no reservations. Hey, a weekend in the Berkshires in early fall sounds fab, no? Perhaps it was the influence of my holotropic therapist friend in Amsterdam, but no, we hadn’t discussed breathwork during my recent visit. In any case, I signed up and as August turned into September, it was soon time to go to Kirpalu. I’d been there to visit once and then again to assist Lauren Raine in her mask making workshop several years ago. Imagine my surprise, directly after checking in, to see my friend Dr. Joe Felser in the hall. He was also there for the breathwork class, drawn to it in an equally mysterious manner. Joe is a professor of philosophy at Kingsborough College in Brooklyn and well versed in metaphysical matters and the author of two excellent books, The Myth of the Great Ending and The Way Back to Paradise. We immediately decided it would be advantageous to choose one another as partners for the breathwork sessions. After all, the devil you know is better than the devil you don’t know! 🙂 Actually we get along quite famously though we do not have that many occasions to meet up. The actual sessions at Kirpalu were very interesting. I did manage to enter an altered state of consciousness which was very dreamlike during my breathwork. I was rather surprised at the demonstrative nature of some of the other participants in their altered states. I wish I was better prepared for that as I found it slightly unsettling. The weekend seemed too short a time to become immersed in this very heady work. I felt it was very compelling though I was not attracted to the idea of reliving the birth trauma. In general I am a fairly happy camper and not attracted to “re-suffering” anything. However this is a keystone in Grof’s method and has no doubt helped many individuals understand the reasons for certain traits and mental aberrations. I am very, very interested in learning the part of breathwork dealing with inducing non-ordinary states of consciousness. Serious synchronicity began to manifest when I returned home. I had purchased and read most of Grof’s book, Holotropic Breathwork and listened to a series of nine CDs called The Transpersonal Vision before attending the class. During the lecture portions of the seminar, Grof mentioned several times another book he had written called When The Impossible Happens. It sounded so familiar to me. I could even see a trade paperback with a blue and white cover, but I couldn’t remember reading it nor buying it. It was a curious feeling. Once I got home I lifted up a few clothes from a box to be put away and there was the book When The Impossible Happens staring me in the face. I don’t know where it came from nor how it got there, and I have no recollection of buying it and that is certainly not where I would have chosen to place it. I thought that it was a definite sign that I should read the book. And so I began to do so. In the opening chapter he speaks of meaningful synchronicity he has observed and that had touched his life. The first example concerned the well-known Joseph Campbell, who was living on the fourteenth floor of an apartment building in Greenwich Village. 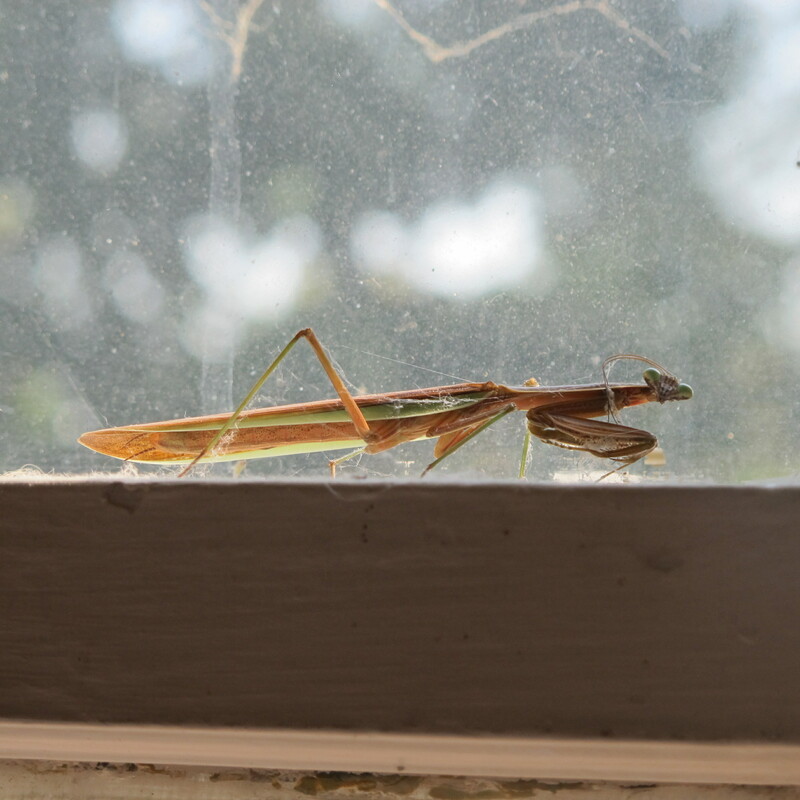 At the time he was deeply involved in studying a Bushman tribe in Africa that worshipped the praying mantis as a God or as the connection to God and then he found a praying mantis on his window ledge. Quite an unusual occurrence for a Greenwich Village apartment! Look at that gorgeous face! I got him/her outside safely. Later the author described his wedding to Joan Halifax the well known anthropologist. (They are no longer married.) They had an unusual shamanic ceremony surrounded by many similar minded friends in Iceland. 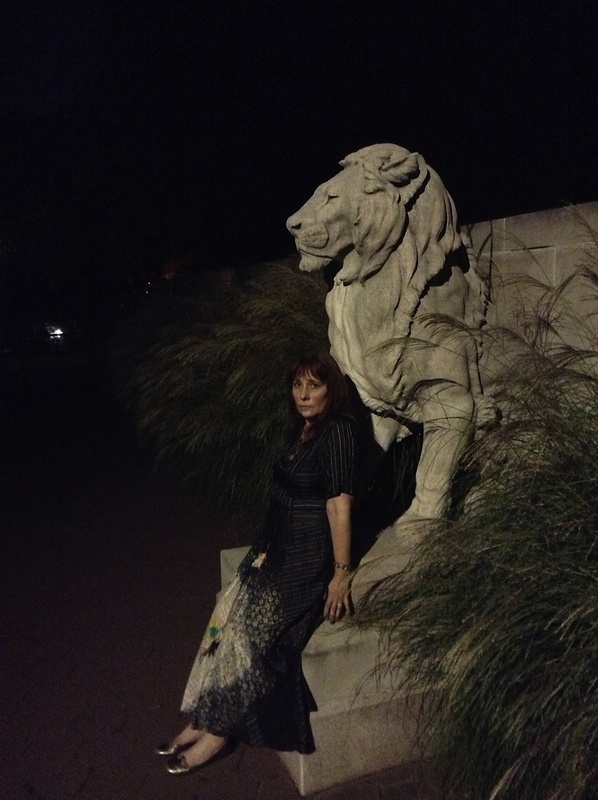 Oddly, I went to a wedding that Saturday night at the Bronx Zoo where the entertainers and some of the guests dressed as animals, which is probably as shamanic as it gets in New York City. The truth is I hardly ever attend weddings, as most of my friends who are the marrying kind have already done so, and in former years I missed many of their weddings due to working at events on the weekend. I average going to a wedding as a guest less than once in five years. After that I temporarily stopped reading the book. The synchronicity shook me to the core. Soon I will resume. Postscript: I am sending out a big thank you to Dr. Stanislav Grof, Tav Sparks, my co-trainers, Nataliya Tarnovskaya and Allen Howell, and my breathwork partner Dr. Joseph M. Felser. Post-post script: On Saturday October 12th, I attended a private meditation group which encourages sharing of non-ordinary experiences which may have occurred during the meditation. I had seen a figure of a dancing whirling blue Shiva figure during my meditation and felt I might have been very suggestible due to reading When The Impossible Happens, wherein are described a series of events of Shivaic synchronicity. However that does not explain why a majority of other meditators saw blue figures, blue energy, blue light and blue objects. One meditator saw swirling energy and another an alien figure in the same physical space where I saw the dancing Shiva.